It is a Thursday lunchtime in a decent real ale pub in the centre of Sheffield. Stood at the bar, watching my pint settle, a voice calls out behind me; "Hello Ian". It is a familiar voice, one that brings back memories for me of local radio and Saturday afternoon sports programmes. To others reading this, the voice might be familiar from reports on 5Live and Final Score. Some of you may have even read his reports and analysis in the national press. Well, up until the days when Yorkshire football gave him something to write about. The man in question is Alan Biggs and we are meeting to talk about the life of a freelance sports journalist and his new book - Confessions of a Football Reporter………another Biggs at Large. We had first met a month or so earlier, a mutual friend introduced us at a party and we agreed to meet up for a chat for A United View. Both Simon (our mutual friend) and I told Alan that night that he needed to "get on twitter!” He did, by the way - @AlanBiggs1 if you wish to follow. We proceed to chew the fat for the best part of an hour, mostly about the parlous state of Sheffield football and Alan's varied career; which now finds him in a less secure working environment than a few years ago. Thanks to the rise of technology, the ongoing failure of South Yorkshire football clubs and, to a greater extent, the rise of the Premier League. "First you realise that you aren't going to be good enough to play for England. Then you realise that you aren't going to be good enough for Chesterfield. Then you decide that if you can't play football for money, you might as well write about it!" Alan's family had moved to Chesterfield from Kent when he was young and the first step in his new career was to take the well respected journalism course at Richmond College in Sheffield. On completing the course he spent "one year of misery in Dickensian conditions" as a trainee news reporter (read "tea boy") at the Derbyshire Times, back in Chesterfield. Alan quickly realised that reporting "Deaths in the District" wasn't going to fast track his reporting career. Around the early to mid 70's local cable TV stations were cropping up around the country. One such station; "Sheffield Cable Vision" was to provide an interesting sideline and a new outlet for Alan's aspirations. "The station was broadcasting to 30,000 homes across Sheffield and I approached them about providing some sports coverage. I was given a sports preview show every Friday evening, moonlighting whilst still at the Derbyshire Times. Unfortunately the station closed 6 months later, but nothing to do with my arrival!" The small screen exposure was still useful and it led to an opportunity to work in a third form of media, just 18 months into his career. Stuart Linnell, then Sports Editor at local commercial radio station Radio Hallam, saw Alan's show and invited him to become a news reporter at the station. Alan eventually succeeded Stuart as Sports Editor in 1980. I tell Alan that I remember his sports shows; "My Dad always used to say 'That Bloody Biggsy's an Owl’". A claim Alan quickly refutes. "I always said I didn't support either Sheffield club. 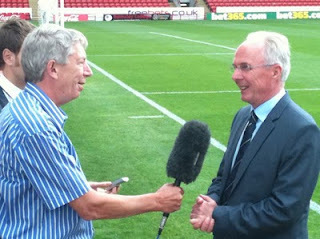 I had an affinity to both, you had to, both working in the city and closely with both clubs, but I support Chesterfield. 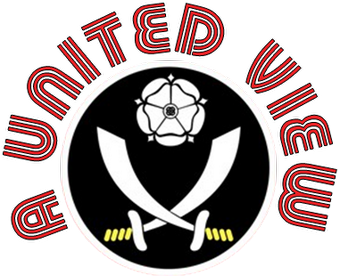 That never stopped the accusations of bias from both sides of the Sheffield football divide though!." It is not only accusations of bias towards either club that is a problem. It can also come from warring factions within a club. In recent years Alan has been a regular columnist in the local weekly Sheffield Telegraph and Alan had a major role reporting the latter part of Dave Allen's reign as chairman at Sheffield Wednesday. His stance, perceived to supporting the incumbent chairman, led to much abuse from the 'Allen Out' brigade. "I look back now and think I was right. You only have to see some of what happened at Wednesday since to see how what Dave Allen was doing was right for the club." For what it is worth Alan recently launched his book at the B2Net Stadium, with former players and ex-referee Keith Hackett in attendance. It was, he says, the natural club to host the evening and for their help he is very grateful. Back to the early 1980's and under his stewardship Hallam Sport was a massive success, broadcasting a mixture of music and sports reports it was a combination which initially didn't sit that well with Alan, yet it out-rated Radio Sheffield's more old fashioned output - where it became the norm to stick on a brass band song at 4:40 to try and bring good luck for a local side needing a goal! It also gave Alan the opportunity to host a Sunday morning show on the station, the "Partridge-esque" titled - Bacon & Biggs - another ratings hit. Yet it all came to an abrupt end in 1984. "I had been on holiday. I walked into my office, looked at my desk of papers and thought - I've got to make a sports show from that! I couldn't face it. I put a piece of paper in the typewriter and typed my resignation. Colleagues looked on in shock. It was spontaneous, I didn't tell the wife until I got home and I had nothing to move to." Thankfully he wasn't out of work for long, Bacon n Biggs continued, he was offered a sports reporting job for the other side (BBC Radio Sheffield) and started writing for Today newspaper the following year. In 1989, a Sport on 2 producer - Peter Slater (still reporting on 5 Live now) offered him a role covering matches in the North of England. Despite the ignominy of being introduced as Alan Gibbs for his first national radio report, he went on to cover anything between 50 and 75 games a season between 1989 and 2005, by which time sports coverage had switched to 5 Live. As a football fan, the thought of being paid to watch that many games excites me and he got to see many exciting games and unusual incidents, not least reporting from Hillsborough as Paolo Di Canio shoved Paul Alcock and the referee fell to the ground in about five instalments. "Excerpts from my report were used in sport trailers for weeks afterwards. It really was an amazing situation and the trailer was nice exposure". Unfortunately, in 2005, the BBC undertook a cost cutting exercise on 5 Live and Alan was one of many reporters to see a healthy line of work disappear. Thankfully for him, the BBC was developing coverage on their Final Score programme and that became a replacement and he continues to report for them to this day. "Everyone in the press box thought it took a deflection. To the naked eye it looked like a standard ricochet and that is how we were all reporting it. It was only when Chappers in the studio came back to me later, with the studio team having seen a replay, that I was able to tell all in the pres box about the balloon. Rapid re-writes all round and I then had to introduce each further update with a new balloon related pun. There are only so many!" Another time Alan dropped on to a big story, whilst reporting for Final Score, was when Phil Brown decided to give his half-time team talk on the KC Stadium pitch, a situation which nearly caught Alan out. "Usually, when the studio comes over, I need to have a 30 second summary ready to report. As the half time whistle blew I stuck my headphones on and glanced down at my scribbled notes. It’s a fast moving programme and they usually come across quite promptly on the whistle, so I was ready and launched into my report on cue. As I was finishing, the producer was talking in my headphones; "Look at the pitch, the players are out there, what's happening Alan?" The viewers at home could see the pictures and Phil Brown talking to his players. I looked up and all I could see, in the far corner of the pitch, were the Hull players sat around on the pitch and the coaching staff stood around them. So I described what I could see, yet didn't really know what was going on. Thankfully, Ray Stubbs in the studio came to my rescue, having the benefit of the pictures he was able to lead the conversation"
Alan covered Northern football, and the Yorkshire and Humberside beat in particular, for many papers over the years. Starting out at Today and taking in the Daily Express, The People, News of the World and Daily Mail amongst others. In fact he is currently pulling together a tribute to Sir Alex Ferguson for a future edition of the Mail. In that time many papers have closed their Northern editions and the focus of reporting football has changed. If you throw in only passing success for Yorkshire football, it is a much harsher environment for a freelance football journalist to work in. "The problem now is that, with a few honourable exceptions, the national papers don't give a damn about the football league. As budgets have been slashed the focus of reporting has switched to the Top 4 or 5 clubs. There is a perception amongst editors that, this is what the public want. They are aiming at a new breed of football follower, non-football going people, who claim an interest and adopt one of the big teams. The type of "fan" who know very little about the game apart from what they read or hear and their eyes glaze over when you talk about any team from outside the Premier League"
Like the Arsenal fan in The Fast Show I suggest? "Absolutely!" If anything, the switch between different media types hasn't helped Alan. Writer, Presenter, Reporter, he reflects that it may have been better to have a niche in one of those areas, rather than spreading his skills successfully, but more widely over all forms. It certainly caused him problems when trying to pull the narrative together for his book. What also causes him a problem these days is the increasing politics and skulduggery around football, particularly around takeovers and financial deals. He speaks with the knowledge of someone who has had his fingers burned. "Reporting on a club takeover is treacherous and in some ways your training leaves you ill-equipped to deal with it. Not only are there complicated financial aspects to understand, but you also meet many people who claim they are interested in buying a football club. Some of these "buyers" look you in the eye and brazenly tell you porkies, they just have a different moral code. There are times I have accepted what they have told me in good faith and reported it. When the promises are broken, I was the one getting it in the neck from the fans. I am a lot more sceptical when dealing with these issues now." Although he still writes for the Daily Mail and The Football League paper and reports for the BBC, there is nowhere near the same volume of work available through traditional sources as there used to be. Alan has had to be alive to potential new opportunities. Unsurprisingly, social media and internet broadcasting are starting to supply them. In some ways that is full circle for a reporter who was alert to the opportunities early cable television provided. I glance at my watch. It's time for me to head back to work. As we depart I ask Alan where he will be reporting from on Saturday? "Oakwell. Barnsley v Watford. I am not expecting any balloons, centre circle team talks or assaults on referees." He was right. It finished one all and not even a yellow card was brandished. It was one of the more standard days in a football reporter's career. A career that, more frequently these days, involves you picking your way through a minefield of emotions, politics and personalities. Thanks to Alan for his time. He was never going to give the best stories away in this interview, so all the more reason to give his book (with a foreword from Trevor Francis) a read. If you would like to buy Alan’s book it is available here or here and in all good bookshops. Great stuff, very interesting read and well done on getting the interview - must have been an interesting insight!